Still working on this section of the yard. We've run out of birch logs to retain the soil so I either a) have to acquire more or b) transition the birch logs to rock along this section. To the right, there is a recessed bed of Barbara's patio plants on Colorado Red flagstones. Saturn hangs above it (also Barbara's) along with the "Pestacide-Free Zone" sign from Metro. 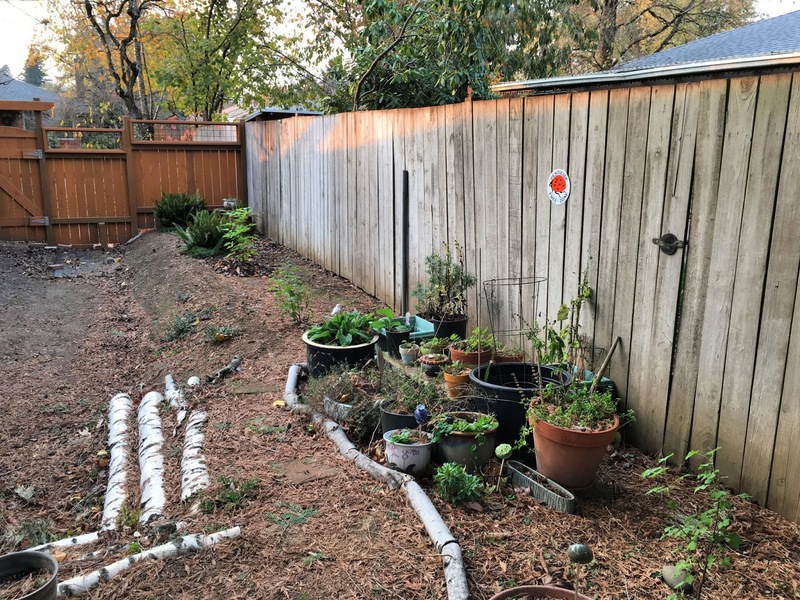 There is a path that snags between Barbara's garden on the right and the birch logs on the left that will eventually wind along the fence behind the plants. Kinnikinnick starts are along the hedge. The plants along the fence are red-flowering currant, red huckleberry, and evergreen huckleberry. Within Barbara's garden are many native perennials and a few non-native perennials. Surrounding it are lots of seaside daisies (Erigeron glaucus). Barbara loved those, so I planted them here just for her. At the base of the hedge is the beginnings of our rain garden. Montana cobble will line it with water-loving native plants within and beside it. I'm still not sure how I want to transition from the birch logs to rock or if I should just continue with birch logs. This is definitely a special part of our yard, so when I'm not sure, I usually take a pause and wait until the right idea strikes me. What do you think?